Nicknamed "Mr. October" for his outstanding performances in World Series play, Jackson solidified his moniker when he hit three consecutive home runs in the 1977 World Series. He is the only non-pitcher to win two World Series MVP awards--in 1973 with the Oakland A's and in 1977 with the Yankees. 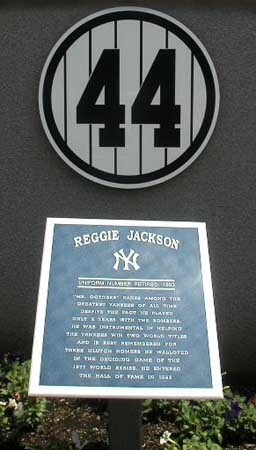 His number 9 has been retired by the A's, and his number 44 is retired and honored in Yankee Stadium's Memorial Park.